The iPad is easy to use, in part because many of the gestures used to navigate it are very intuitive. It's very easy to get started on the iPad, tapping app icons to launch them and swiping to scroll through various pages and menus. But do you know every gesture on the iPad? As the iPad has become more geared for productivity, it has picked up a number of useful gestures that not everyone knows. These include a hidden control panel, a virtual trackpad, and the ability to bring up multiple apps on the screen. And when you combine these gestures with the ability to tell Siri to set up reminders, meetings, and the hundreds of other things Siri can do for you, the iPad can become quite a boon for productivity. The most basic iPad gesture is swiping your finger to scroll through pages or lists. You can scroll down a list by placing the tip of your finger at the bottom of the screen and moving it towards the top of the display to swipe up. At first, it may seem counterintuitive to scroll down by swiping up, but if you think of it as your finger moving the screen, it makes sense. You can scroll up a list by swiping down, which is accomplished by placing your finger at the top of the screen and moving it toward the bottom of the screen. The speed at which you swipe also plays a role in how quickly a page will scroll. If you are on Facebook and slowly move your finger from the bottom of the screen to the top of the display, the page will follow your finger with only slight movement after you lift it from the screen. If you swipe quickly and lift your finger immediately, the page will fly by much faster. This is great for getting to the end of a list or web page. If objects are displayed horizontally, you can sometimes swipe from one side of the screen to the other side to navigate. A perfect example of this is the Photos app, which displays all of the photos on your iPad. When you are viewing a photo full screen, you can swipe from the right side of the iPad display to the left side to move to the next photo. Similarly, you can swipe from the left to the right to move to a previous photo. This also works in apps like Netflix. The "Popular on Netflix" list shows movie and TV show posters across the screen. If you swipe from right to left on the posters, they will move like a carousel, revealing more videos. Many other apps and websites display information in the same way, and most will use the swipe for navigation. This is another basic gesture that you will use all the time once you master it. On web pages, most photos and many other screens on the iPad, you can zoom in by pinching out. This is accomplished by touching your thumb and index finger together, putting them in the center of the screen and then moving your fingers apart. Think of it like you are using your fingers to stretch the screen out. You can zoom back out by placing the same two fingers on the screen while they are apart and pinching them together. This gesture will also work with three fingers, so long as you make the pinch out and pinch in gestures on the screen. If you've scrolled down a web page and want to get back to the top, you don't need to scroll back up. Instead, you can tap the very top menu, which is the one with the Wi-Fi signal on the left and the battery gauge on the right. Tapping this top menu will take you back to the top of the web page. This will also work in other apps, such as moving back to the top of a note in Notes or moving to the top of your Contacts list. In order to move to the top, aim for the time that is displayed in the very middle of that top bar. In most apps, this will take you to the top of the page or the beginning of a list. This is a great trick you can do with your iPad. While you are on any Home Page — which is the page that displays your apps — you can swipe down on the screen to reveal the Spotlight Search. Remember, just tap anywhere on the screen and move your finger down. Spotlight Search is a great way to search for just about anything on your iPad. You can search for apps, music, contacts or even search the web. Swiping down from almost any part of the display while on the home screen will bring up Spotlight Search, but if you swipe from the very top edge of the display, the iPad will show your notifications. This is where you can see any text messages, reminders, events on your calendar or notifications from specific apps. You can even bring up these notifications while you are on the lock screen, so you don't need to type in your passcode to see what you have planned for the day. The Control Panel is probably one of the most useful 'hidden' features of the iPad. We refer to it as hidden because many people don't even realize it exists, and, yet, it can be extremely useful. The control panel will let you control your music, including adjusting the volume or skipping a song or turn on features like Bluetooth or AirDrop. You can even adjust the brightness of your screen from the Control Panel. You can get to the Control Panel by swiping up from the very bottom edge of the screen. This is the exact opposite of how you activate the notifications center. Once you begin swiping up from the bottom edge, you will see the control panel start to appear. Another handy swipe-from-the-edge gesture is the ability to swipe from the left edge of the display toward the middle of the display to activate a 'move back' command. In the Safari web browser, this will take you to the last visited web page, which is handy if you've gone into an article from Google News and want to get back to the news list. In Mail, it will take you from an individual email message back to the list of your messages. This gesture doesn't work in all apps, but many that have a list that leads to individual items will have this gesture. It seems, every year, media outlets talk about how Apple no longer innovates, and yet every year they seem to come up with something really cool. 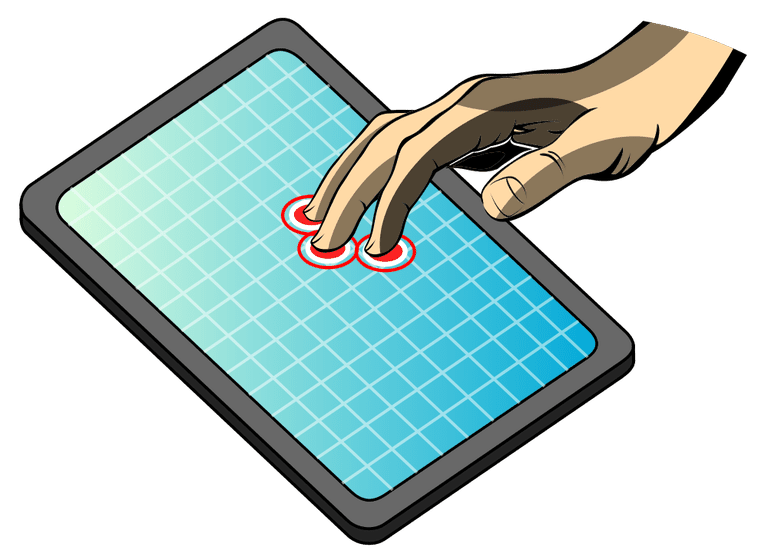 You may not have heard of the Virtual Trackpad, which is too bad because if you enter a lot of text into the iPad, the Virtual Trackpad is completely awesome. You can activate the Virtual Trackpad any time the on-screen keyboard is active. Simply put two fingers down on the keyboard at the same time, and without lifting the fingers from the display, move the fingers around the screen. A cursor will appear in your text and will move with your fingers, allowing you to easily place the cursor exactly where you want it. This is fantastic for editing documents and replaces the old way of moving the cursor by pressing your finger inside the text you are attempting to edit. This gesture will only work on the iPad Air or iPad Mini 2 or newer models, including the new iPad Pro tablets. The trick here is that the gesture only works when you already have an app open. Placing your fingertip in the middle of the far-right edge where the screen meets the bevel and sliding your finger toward the center of the screen will engage Slide-Over multitasking, which allows an app to run in a column along the side of the iPad. If you have an iPad Air 2, iPad Mini 4 or newer iPad, you can also engage Split-Screen multitasking. The apps loaded will also need to support this feature. With Slide-Over multitasking engaged, you will see a small bar between the apps when Split-Screen is supported. Simply move that small bar toward the middle of the screen and you will have two apps running side-by-side. Placing four fingers on the iPad display and then left or right will navigate through the active apps. Moving your fingers left will take you to a previous app and moving them right will take you to the next app. Moving to the previous app only works after you use the gesture to move from one app to the next. If the app you have open was launched from the home screen and you haven't used a multitasking gesture or the multitasking app bar to move to another app, there won't be a previous app to move to using the gesture. But you can move to the next (last opened or activated) app. This one isn't too much of a timesaver, considering you can do the same thing by double-clicking the home button, but if your fingers are already on the screen, it is a nice shortcut. You can bring up the multitasking screen, which shows a list of recently opened apps, by placing four fingers on the iPad screen and moving them up toward the top of the display. This will reveal a list of your apps. You can close apps using this screen by flipping them toward the top of the screen with a quick swipe up or swipe from side to side to navigate the carousel of apps. Another shortcut that can be accomplished using the home button (this time with a single click), but still nice when you have your fingers on the display. This one works like zooming into a page, only you'll use four fingers instead of two. Just put your fingers on the display with the tips of your fingers spread apart, and then move all your fingers together like you were grasping an object. This will close out of the app and take you back to the iPad's home screen. If you are just getting started with the iPad, it can be a little daunting. You can get a head start by going through our basic iPad lessons, which should take you from beginner to expert in no time.